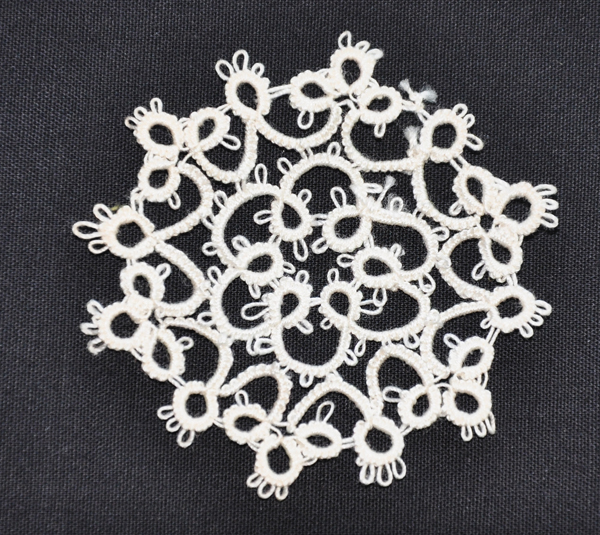 It has been said of Scott’s great great aunt Dotie that “she would tat around anything that sat still long enough.” This week we were blessed to be given a box of her tatting that had been saved by Scott’s great aunt Lynn who passed away last year. In the box were yards and yards of edging that she had tatted, as well as, about 25 motifs. I came home with the motifs and will be using them on the Christmas tree this year. 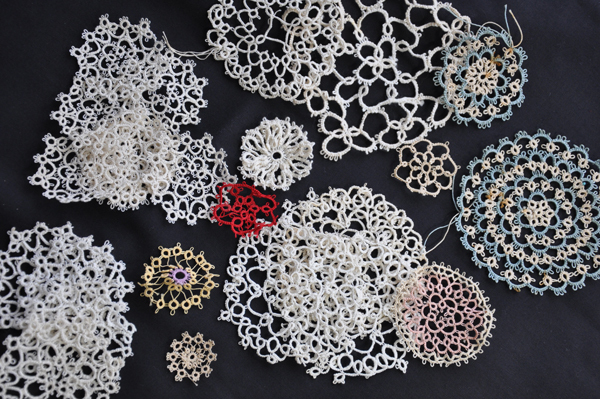 They are all in need of a good washing and stiffening, but they are all so intricate and beautiful even as they are. She was very good at it, indeed! 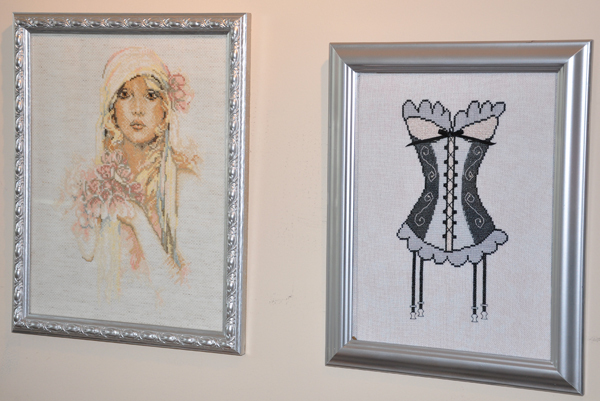 This week I also managed to get the Corset cross stitch framed. I bought a black frame and spray painted it silver along with another frame holding another cross stitch from the past that was gold. Now both pieces match and I think they look awesome! While I am still waiting for Sock Madness 2011 to begin, I started my next tatted motif, twice. Yes, attaching to the wrong picot seems to be a problem of mine… It should be completed next week, so photos will have to wait until then. In other news…my diagnosis is finally in and we have found out that it is not cirrhosis after all. Apparently, I have a 1/1,000,000 rare disease of the liver called Caroli disease. To most doctors, other than liver specialists, it looks like cirrhosis. This explains why the doctors were so perplexed at first and kept asking me if I was a heavy drinker or drug user. My family keeps reminding me that this means that I am one in a million. Hahaha… So, now that we have a diagnosis and a prescription regimen, we will just monitor things from here on out. If things go downhill in the future the “cure” is a liver transplant. I don’t know what the future holds, but I have a feeling that a transplant is a long way off. 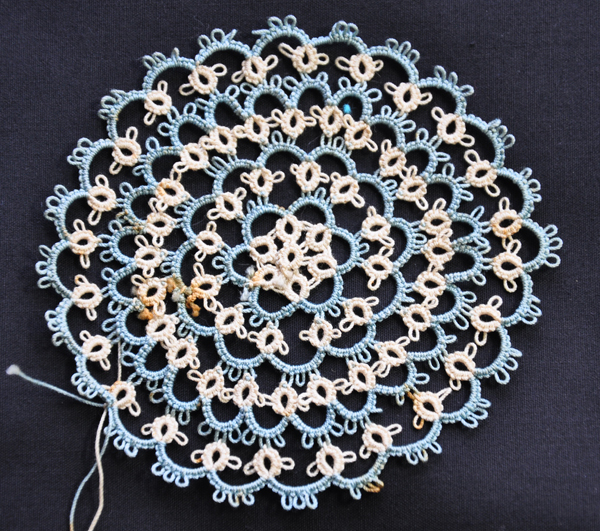 Thank you for sharing the beautiful tatting. I’ll never forget being a young teen at my grandmother’s house when she was hostess to her Lady’s Aide circle (church group). One lady kept talking about working on her “titting”. I had to leave the room!